Your trip begins with a pickup from Desert Gardens Hotel at 1:45 p.m. This afternoon travel to Watarrka National Park, home of Kings Canyon. Along the way enjoy a variety of outback scenery, including vibrant red dune country, and the craggy ranges of Central Australia. 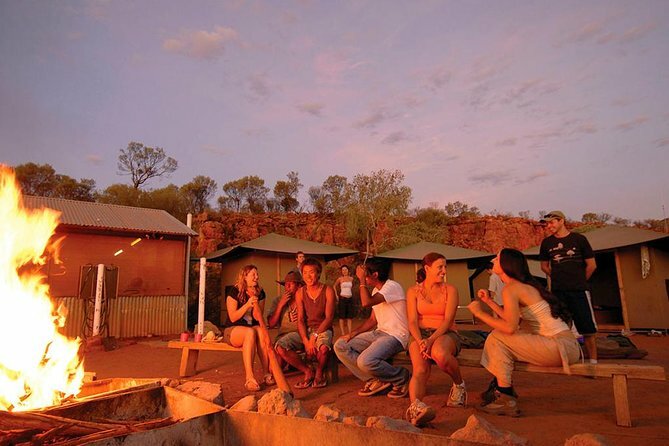 When you reach the secluded campsite near Kings Canyon, relax and unwind under the millions of stars. The full 3.7-mile (6-km) Kings Canyon rim walk requires an early start. Take your time to admire the sandstone domes of the Lost City, the cliff top views along the North and South Walls and the beauty of the Garden of Eden; all whilst learning about the flora, fauna, history and culture of this area from your knowledgeable guide. Your journey back to Uluru passes Atila (Mt Conner) with its unique flat top, before stopping for a break at Curtin Springs Station Roadhouse. Lunch is enjoyed en-route, you will also take in the magnificent red domes of Kata Tjuta as we enjoy the Walpa Gorge walk. Following your walk, watch the colors of the horizon change as the sun sets over Uluru. Tonight camp at the permanent campsite at Yulara. It’s an early start this morning to witness an Uluru sunrise. While the morning is fresh, enjoy an unguided walk around the base of the Rock, seeing the Rock change from every angle as you take in its sheer size and beauty. It is a unique opportunity for your guide to share experiences, connect with and learn about the oldest culture on earth. The tour will finish at Ayers Rock Resort or Yulara Airport before lunch.